Are you a pool table owner in need of a high-quality billiard cloth for your pool table? If so, you have come to the right place. Here we have reviewed several of the hottest-selling and most popular pool table fabrics currently available, and highlighted the advantages and drawbacks of each cloth. 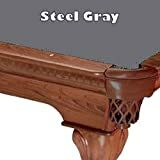 We have also included a Billiard Cloth Buyers Guide, in which we have outlined and explained the various factors you should look for when shopping for pool table felt. Although available in different sizes, this particular Championship Saturn II Billiards Cloth Pool Table Felt measures 90 inches by 48 inches, enough for a 7 foot bed cloth and six liberally cut rails. With a makeup of 75 percent genuine wool and 25 percent nylon, this blended worsted fabric is extremely fast and ultra-responsive. The manufacturing process of this awesome billiard cloth, with blended wool and a tight weave, provide superior cloth stretching capability that allows this cloth to last. 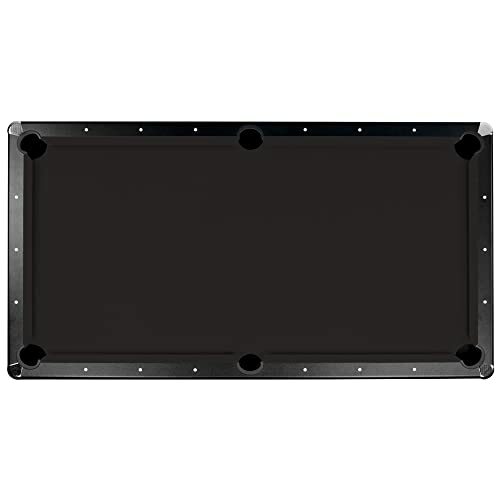 The Championship Saturn II Billiards Cloth Pool Table Felt is coated with tough DuPont Teflon that enables the billiard cloth to resist stains. 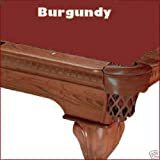 Included in the purchase price are a table spot and 2 pieces of color-matched cue chalk that won’t show up on the table. The play-resistant cloth is strong enough to stand up to regular commercial use, yet satisfies the most discriminate amateur and professional players. Available in a variety of colors to match the décor of your game room, this affordably priced cloth is a must have for the serious billiards player. Many colors available. The Championship Saturn II Billiards Cloth Pool Table Felt is available in a variety of color options. Fast. The 20 ounce wool fabric and high percentage of nylon makes for a very fast table. Budget-friendly. 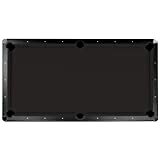 The Championship Saturn II Billiards Cloth Pool Table Felt is the most budget friendly item on our list. May not last as long as other cloths. With 25 percent nylon in its makeup, the Championship Saturn II Billiards Cloth Pool Table Felt may not be as long lasting as other felts. Rail cuts a bit off. The Pre-cut rails, according to some users, did not always fit as promised. The 8′ Steel-Gray ProLine Classic 303 Billiard Table Cloth comes with a pre-cut 8-foot bed and pre-cut rails to make installation a snap. This medium-speed cloth has just the right blend of long lasting wool and speed-gaining nylon to satisfy pool players of all ability levels. The 21 ounce fabric is made to stand up to frequent play, and the stretch of the fabric leaves no discernible nap, creating a straight and even playing surface. Recommended for both home and commercial use, the 8′ Steel Gray ProLine Classic 303 Billiard Table Cloth has a felt like texture that provides a tough surface for all levels of play while still maintaining more than adequate speed. A cloth that combines both durability and performance for any size table, this 80 percent woolen/20 percent nylon cloth comes pre-cut and ready to go. Durable. The tough 21 ounce 8′ Steel Gray ProLine Classic 303 Billiard Table Cloth is very durable and long lasting. Pre-cut. Comes with a pre-cut 8-foot bed and 6 pre-cut rails. Premium priced. The 8′ Steel Gray ProLine Classic 303 Billiard Table Cloth has a premium price that may not appeal to the budget conscious. Can stain. With no Teflon coating, the felt can become stained by chalk, spilled beverages, etc. Made with a Teflon coating to resist stains and impacts, the Championship Invitational Pool Table Felt is the same terrific fabric used on the company’s original Invitation line, only this cloth has an added layer of tough DuPont Teflon added to the fabric before the weaving process. Cut to a size of 66 inches by 124 inches for the bed, with 6 precise rail cuts, this woolen Championship fabric sports an 80/20 blend of genuine wool and nylon, giving the fabric both speed and durability. Boasting a 20 ounce weight, the cloth allows for a much faster ball roll than heavier fabrics, and because there is no nap in the felt this speed is multi-directional. The product comes complete with a Master Spot and two pieces of matching silver chalk. Teflon Coating. The DuPont Teflon coating on the Championship Invitational Pool Table Felt helps the fabric to resist all types of stains and marks. Master Spot and matching chalk included. The product comes with matching chalk and a Master Spot included in the purchase price. Fast. With just a 20 ounce weight, the Championship Invitational Pool Table Felt with Teflon is very fast. Durability Issues. The same 20 ounce weight that gives this product its speed could create durability issues. Do you own a pool table or run an establishment that has one or more billiard tables in it? If so, there may come a time in which you are forced to replace the felt on the tables. And when that time comes, it will be extremely important that you know exactly what to look for when buying this pool table cloth. According to experts, there are a number of factors you will need to consider when purchasing a billiard cloth for your pool table—factors that can have a major impact on the playability of the surface and your pocketbook. To help you make a more informed decision in this regard, below we have outlined several of these factors and considerations that will help you ask the right questions when it comes time to replace your felt. When creating pool table cloth or felt, there are two fabric processes that are generally used. These two processes tend to produce very different outcomes that can have a major impact on the manner in which the pool table felt will play. The two processes are known as Worsted and Woolen—two words you will hear or see regularly when shopping for pool table cloth. Both of these cloth types are produced throughout the world, including in the United States. Even though the terms Worsted and Woolen refer exclusively to the textile processing of animal fibers, they are now often used to describe the fiber blend that is created through each process. In addition to these two terms, you will also hear the terms cloth, felt and baize used interchangeably. Although only used in certain parts of the world, Worsted cloth is often referred to as “speed cloth.” Like woolen cloth, worsted cloth is manufactured from the sheep’s wool, but due to the specific manufacturing process used to make it there is no discernible nap in the cloth so it is not directional. This absence of nap is what makes worsted cloth play faster than its woolen counterpart. Some worsted cloths are made with a mixture of wool and nylon; and a greater amount of nylon in this mixture can lead to what are known as “burn spots” on the worsted speed cloth. Because of the process used to make worsted cloth, it typically turns out stronger, finer, smoother and harder than pure woolen billiard cloth. Worsted fabrics are not only made for pool felt. They are often used in the making of tailored suits and other fine products. 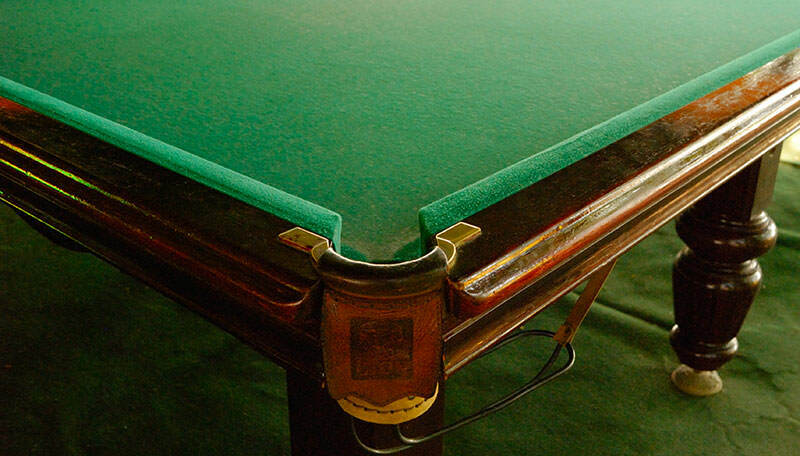 In the United States, worsted cloths are the norm, but they can also be found on pub pool tables across the globe. If you make a visit to the U.K or virtually anywhere in Western Europe, you are far more likely to encounter woolen cloths on the billiard and snooker tables there. In fact, the vast majority of tournament pool and snooker play in that part of the world is conducted on tables with a woolen cloth base. Unlike worsted cloths, which have no nap, the nap on woolen cloth is clear and overt, making the fabric directionally organized. In fact, when you run your hand along the surface of a woolen covered table you can actually feel the nap of the cloth running in a single direction. Woolen cloth has a silky texture and because of its nap you can often leave finger impressions on the felt during a game. Additionally, woolen cloth requires much more regular brushing than its worsted counterpart; and it can actually be ironed to keep the fibers running in the right direction, thus eliminating any “bumpy’ spots in the felt. 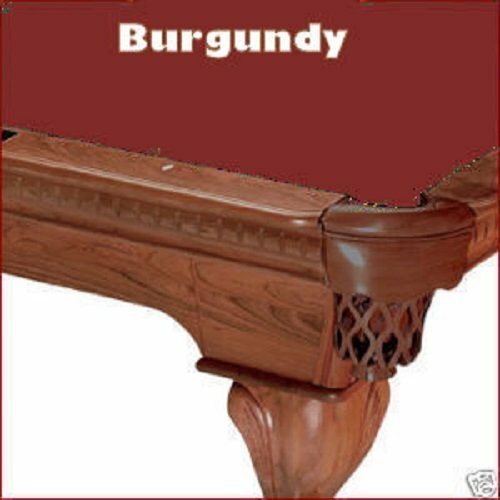 Of course, if given the choice we would all prefer a durable cloth with which to cover our precious pool table. Unfortunately, there is no easy way to measure just how durable a pool cloth is going to be. Most durability issues will be predicated on two factors: the amount of times the table is played on; and how well the billiard cloth is regularly maintained. With these two factors in mind, it only stands to reason that a commercial pool table’s felt will generally not last as long as felt that is on a personal billiard table, as the commercial table will almost always see more play. Whether you go with a worsted speed cloth or a woolen cloth, the felt on a home table will almost surely have much greater longevity. Wool is a durable fiber. Thus, the higher the wool content in a pool table cloth, the longer lasting it will typically be. Thus, if you elect to buy a worsted cloth with a combination of wool and nylon, be sure to look for the highest wool content and thus the lowest percentage of nylon. Another measure that may impact the longevity of a given pool table cloth is its weight. The weight of the billiard cloth is a measurement that is always expressed in ounces per yard. So when shopping around, you may see numbers like 20 ounces or 21 ounces all the way up to 29 ounces and 30 ounces. Heavier cloths, by their very nature and makeup, will last longer than lighter cloths, but there is also a downside to this heavier weight: they will play much more slowly than lighter weight cloths. The most accurate measurement of the durability of a particular billiard cloth is its tightness and the quality of the weave. Sadly, however, manufacturers of these products rarely release this information. In summary, heavier cloths with greater wool content are almost always more durable than lighter cloths with a greater percentage of nylon, but they are also much slower on which to play. The tightness of the fabric and the quality of the weave are the real indicators, so it pays to go with a trusted manufacturer than some fly-by-night industry. In the end, the real determinant of longevity is how often the table is played, along with how well it is maintained by the owner.